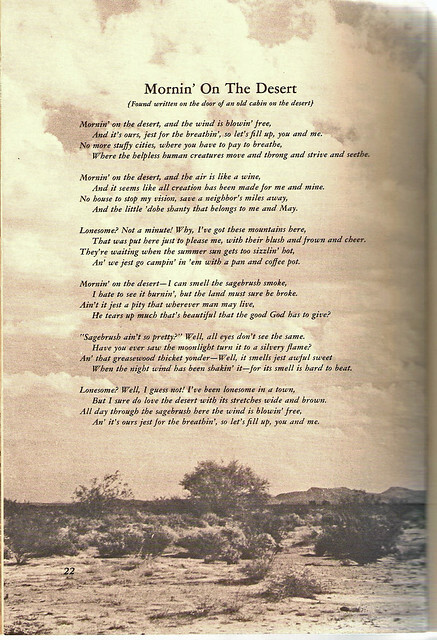 Mornin on the desert poem from 1955 | Flickr - Photo Sharing! Dad found a copy of the Ed Ainsworth book "Five acres of Heaven" (almost new condition!) in a box of stuff saved from my grandparents whom lived on the "mesa" in Yucca Valley. There was also a letter describing homesteading inside the book. I assume this was materiel my grandparents sent for before deciding to move to the High Desert from the LA area in the late 50's. If you click on "map" below, you will see the location my grandparents built and lived in until selling the place in the 1980's. It's where I spent many summers as a kid too. Could i maybe borrow this book sometime? Sounds like something i'd enjoy reading.